What is criteria for MBA admission?Am i eligible after completing B.Sc in IT with 57% marks? Eligibility for CMAT with 49.68% in graduation? Eligible to appear for MAH-MBA or MMS-CET this year after completing graduation with 49%? Am i eligible for MBA course after completing BE with 48%? Re: Am i eligible for admission in MBA course after completing graduation with 50%? Ya you are eligible to pursue MBA. Your percentage can be rounded off as 50. MBA is aTwo years course with four semesters and the fee structure varies fromuniversity to university. To get admitted to good MBA institutes you try to clear CAT,MAT etc or else try to get seats in deemed universities which you feel the best. In distance education the eligibility for admission is Any Degree (except 10+2+2 pattern) or an equivalent examination. You are still eligible for MBA even though you do not have 50% in your graduation if you belong to SC/ST category. *The minimum eligibility criteria for admission to PG course is at least a 3-year Bachelor's degree or equivalent in any discipline recognized by the Association of Indian Universities (AIU)/ All India Council for Technical Education (AICTE) as eligible for Post-Graduate Studies in Management. 3You can also go for other fields where marks is not a barrier such as courses in aviation ,hotel management ,tourism etc. 2. Passing marks in Graduation to 50% marks in graduation. 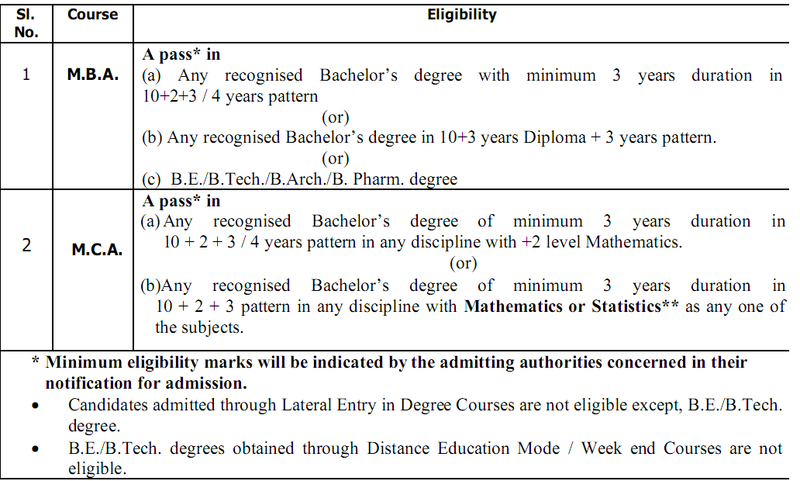 You are lying in a very critical criteria of the admission via Ge category.As to be eligible for the MBA course one must be graduate from a recognized university with minimum 50% marks in the graduation aggregate.There is only one possibility to get the admission in the MBA college If you belong from the reserved category student.If you belong from the SC/ST/PD category student then only you will get the relaxation by 5%. As per my knowledge you are not eligible for the MBA course with 49.83%.But you can contact to the MBA college in which you are interested to take the Admission.You can tell your problem to them They will tell you more about the admission process and criteria for you. You need to have a bachelor's degree (3-year course) or equivalent in any discipline with atleast 55% from recognized by any Indian University / AICTE as eligible for post-graduate studies. ~~~Most of the MBA Colleges require Minimum 60% Percentage of marks . The Admission for MBA Course is based Entrance Examination Performance . ~~~In your bachelor degree marks what you have scored is very low % . So, in reputed colleges it is very difficult to get admission . If your really [Management Aptitude Test]Interested to Apply for MBA Course then you Apply for MAT Examination . The MAT Examination score card may accept Many MBA Colleges in India .So that you can get a chance to get admission in MBA courses. MAT stand for and this Examination is conducted by All India Management Association . This Examination held every four times in a year . To apply for this Entrance Examination you should Qualified in Bachelor degree. Final Year candidate may also eligible to apply for this Examination .